Kitsuki is an uneven castle town with samurai houses on plateaus to the north and south and the commercial district sandwiched in the valley between them. This is a very rare shape for castle towns in the country, and it is said to be the only “sandwich-shaped castle town” in Japan. You can see the town’s beautiful shape from Shioya-no-saka Slope. It is a popular photo spot, and it often appears on television. The castle town of Kitsuki, with its strong Edo period feel, was the first town in the country to be certified as a “historic townscape where kimonos look right at home.” Admission is free to sightseeing facilities such as Kitsuki Castle, etc. for those wearing a kimono. You may also receive bargains at 30 different locations including restaurants, etc. Kitsuki is considered a “little Kyoto,” and the town communicates the Japanese kimono culture to the world with the intent of becoming a town where kimonos look right at home second only to Kyoto. 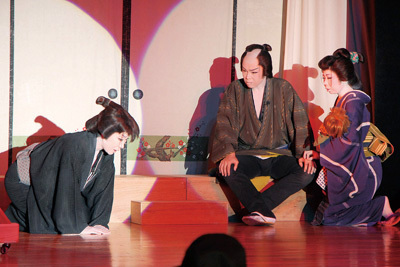 The Kitsuki Shuraku-kan is a theater where you can enjoy traditional Japanese plays. The building, a remodeled old sake warehouse, has an old-time charm, and the actors wearing gorgeous kimono portray people from the Edo period. You can take photos together with the actors. There is also a restaurant and a souvenir shop inside the theater. 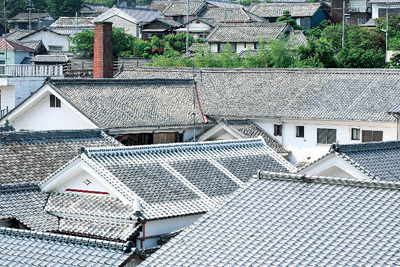 The view of the tiled roofs of the merchant houses from Tenjin-zaka Slope is very beautiful and a must-see. Climbing the slope, you will come to a very rare place in the country, a place of powerful spot where shrines, churches, and temples stand in rows. There are rows of temples in Tera-machi, and these served as strongholds for the western part of the castle town. 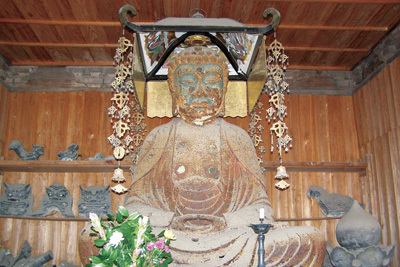 The temples were used as places for samurai to gather together during times of war. There are many things to see here such as Yotokuji Temple, which was the family temple of the lord of the Kitsuki Clan, Shokaku-ji Temple, which has enshrined the largest iron statue of Buddha in Japan, and Chosho-ji Temple, which has an elegant garden considered to be Kyushu’s representative Japanese garden. The Sano family was of high social standing, and served as doctors for 400 years. 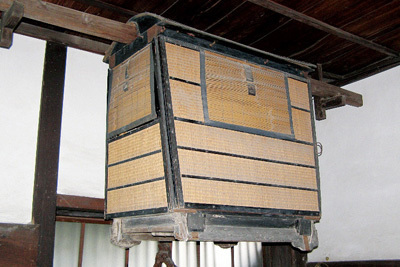 The residence is the oldest mansion remaining in Kitsuki, and there is a basket hanging in the entrance way. There are many ancient medical implements on display, and this residence has elegance different from the Samurai Residences. The Ameya-no-saka Slope forms a beautifully curved chevron. 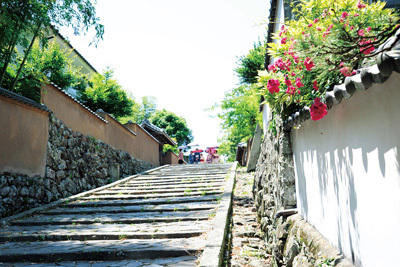 It is said that the stone steps of the slope are easy to see even on rainy nights because the stones shine white. 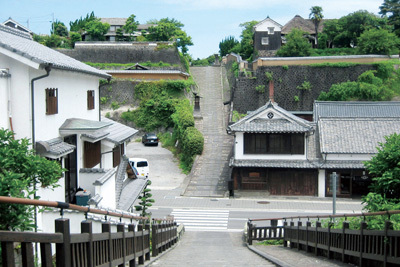 The slope connects the commercial district with the Minami-dai Samurai Residence area, where you can still find stone walls and whitewashed walls. In the commercial district, there are still many long-standing shops that carry on traditional tastes and craftsmanship. Please visit the shops such as the old-time tea shops and miso shops, and come in contact with unique Japanese hospitality and culture. The looks and insides of each shop have their own individual charms. This wonderful view is often used for period dramas, TV dramas, and commercials. This is one of the most beautiful spots in all the castle towns in the entire country, and so this is the number one sightseeing spot. The view from the top of the slope is very dynamic, and the contrast created by the two slopes interweaving is an indescribably beautiful sight. The rows of samurai residences in the Kita-dai Samurai Residence Street, which look very much like they did during the Edo period, are a wonderful sight. Historic buildings like the Ohara Residence, the Isoya Residence, and the Clan School Gate (Hanko-no-mon) still look just like they did at the time. 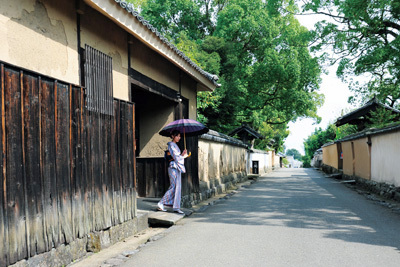 You will likely never forget the area once you see the rows of earthen walls where the samurai used to walk. 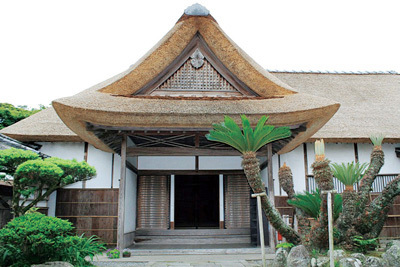 An elite family of samurai lived in the Ohara Residence during the Edo period. There is a beautiful and elegant Japanese garden within the spacious grounds. Please take your time as you enjoy it. Inside the residence, you can take a commemorative photo holding a Japanese sword, and you can enjoy feeling like a samurai. The Nomi Residence is a high-class samurai residence, and the beautiful Japanese garden is well worth seeing. You can relax in the café inside the residence as you enjoy eating lunch and sweets, etc. Please feel free to play the Japanese harp placed in the residence and enjoy its sounds. 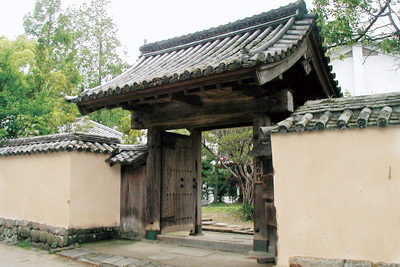 The Clan School Gate led into the school where the samurai and their children studied and practiced martial arts. This historic gate still looks exactly the same today, more than 200 years later. The gate is a valuable historic asset for Kitsuki, and it is now used as an elementary school gate. I hope you feel like a samurai as you pass through it. The lord used the Isoya Residence as a rest spot. The highlight is the Japanese garden, which shows the beauty of the seasons and can be viewed from any room. You may freely play the Japanese harp placed in the residence and enjoy its sounds. The beautiful and straight Kanjoba-no-saka Slope connects Kitsuki Castle and Kita-dai Samurai Residences. 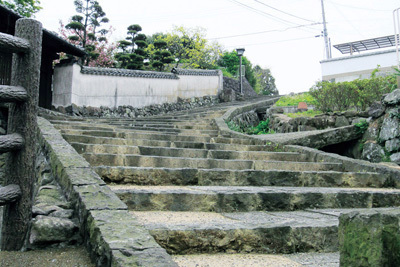 Among the stone steps, there are fan-shaped and Mt. Fuji-shaped stones. Please try to find them. It is said that, if you pray while facing east standing on top of the Mt. Fuji-shaped stone, then your wish will come true. 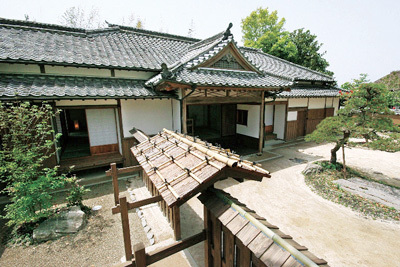 A family of elite samurai lived in the charming Nakane Residence. The grounds are very spacious, which shows how prosperous they were at the time, and the two tea-ceremony rooms inside the house are still used to hold tea ceremonies. 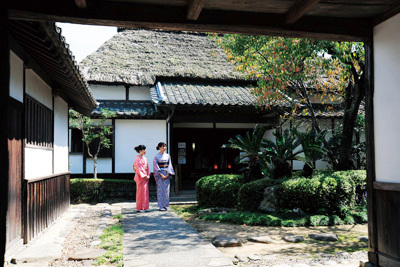 Kitsuki flourished as a castle town, and a number of the town’s treasures are on display at the Kitsuki Castle Town Historical Museum. Looking at the diorama recreating the ancient townscape, you can clearly see that the castle town is shaped like a sandwich. 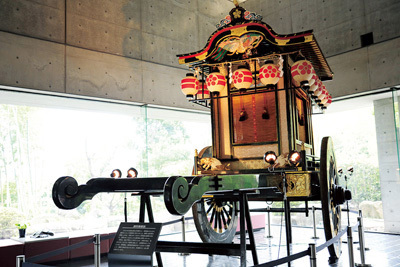 The gorgeous carriage of a high-ranking person and luxurious theater costumes are also on display. The observation platform is located at the eastern end of the Minami-dai Samurai Residence Street. 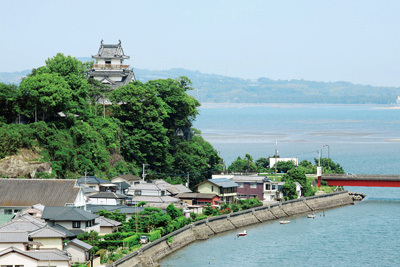 From this view spot, you can see the beautiful sea extending out in front of you and the castle tower of Kitsuki Caste, which stands atop a slightly elevated hill. You can see the scenery very far away on clear days. This wonderful view spot often appears on television, and we recommend taking commemorative photos here. 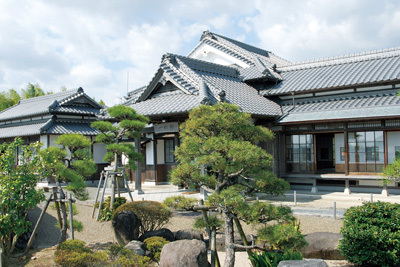 The Hitotsumatsu Residence is an extremely luxurious mansion built using advanced Japanese architectural techniques. The house gives a wonderful view of Kitsuki Castle and the sea, and this makes it popular among tourists. Kitsuki Castle is the smallest castle in Japan, and the highlight is the view of the sea from the castle tower. Suits of armor, helmets, and swords used by the samurai are on display inside the castle. Take a commemorative photo dressed as a warrior in a real suit of armor and helmet. 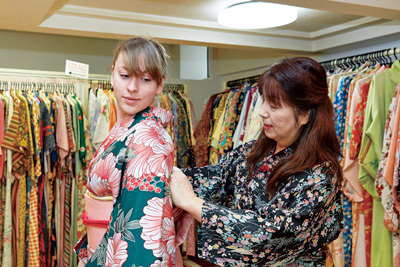 Warakuan Kimono Rental conducts kimono rental and fitting. You can choose your favorite kimono from over 250 different designs. 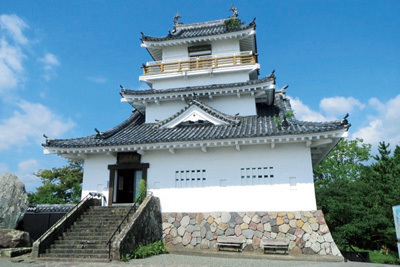 Admission is free to sightseeing facilities such as Kitsuki Castle, etc. for those wearing a kimono. There are also delightful, free benefits available at various restaurants, etc. By all means, please wear a kimono as you walk around Kitsuki, a town where Japanese clothing looks right at home, and take lots of photos of yourself wearing in your kimono. 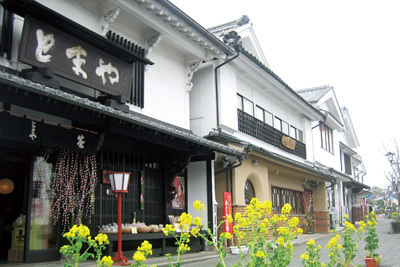 The Kitsuki Local Products Center, which looks like a storehouse on the outside, is the Kitsuki general souvenir shop. 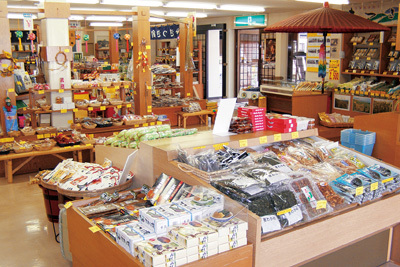 The shop sells delicious local sweets, teas, marine products, and liquors. You can casually enjoy Kitsuki tea and coffee in the café inside the shop, and you can enjoy local dishes made from all sorts of ingredients from the land and sea in the restaurant next door. 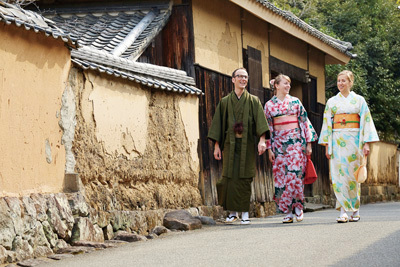 In Kitsuki, you can enjoy activities overflowing with Japanese taste including wearing a kimono. 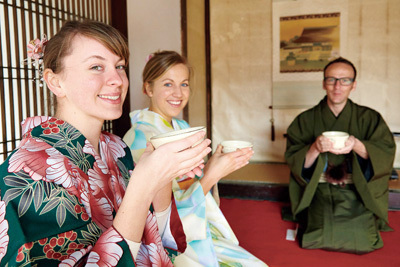 At “Tomaya Tea Vendors,” you can drink delicious Japanese tea while enjoying experience of the tea ceremony inside a charming merchant house. In addition, at “Hana Kobo Aya,” you can experience making pressed flowers and cloth flowers. Please give them a try as a memory of the Kitsuki castle town.